Small and medium businesses continue to choose cloud computing as their network management service for various reasons. The flexibility of the price that goes well with the tight initial budget of taking the business online, the flexibility of the computing resources that can be used based on demand sits well with a business that has not established a consistent following and market, and the convenience that easy-access data can provide for the management of business thru the Internet. The cloud, however, is not perfect. The Internet is a double-edged sword that can give cloud computing advantages and disadvantages. It has its own issues like security and control. 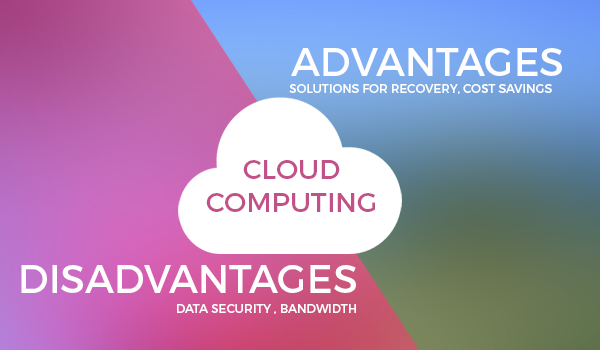 These are just some of the cloud computing advantages and disadvantages. In the list of cloud computing advantages and disadvantages, disaster recovery is one of the top features of cloud computing that attracts businesses. Since data loss is a problem that all business should be able to handle efficiently, especially after a data breach, disaster recovery helps a business bounce back and keep the business afloat despite a setback as serious as cyber attacks. Disaster recovery provides the assurance that your data is secured and that grave damages can be avoided in case of unfortunate events. Cloud computing offers faster and more efficient disaster recovery by clicking a few buttons instead of the traditional distribution, collection and transfer of data to a central location. Among the cloud computing advantages and disadvantages, cost savings appeals to new entrepreneurs the most. Since taking your business online is another budget you need to set aside on top of the usual expenses of your business, small and medium businesses that need to tap the virtual market yet do not have much money to spare seek opportunities using cloud computing. In cloud computing, you no longer need to purchase external hard drives to keep your data intact and accessible. This saves up to 43% of the annual budget thru migration of virtualized operating system and other computing resources into the cloud. Also, cloud computing provides expert support, security systems, (remote) hardware and software that would usually cost more in traditional network management. Lastly, the flexibility in pricing that cloud computing offers is based on the resources you used, so you don’t have to pay for a subscription that you can’t always maximize. These savings can surely help a new online business take on the Ecommerce challenge. Even if cloud computing has numerous advantages, a wise consumer, especially for the online business that you are trying to put up, should be aware of the setbacks in using cloud computing. Among those in the list of cloud computing advantages and disadvantages is the need to be cautious with bandwidth. Some cloud computing services offer limited bandwidth which can cost you much more than you save if you exceed your bandwidth allowance. Bandwidth refers to the capacity to accommodate traffic going in and out of the site. Cloud computing offers a particular allowance for that bandwidth, given that you can predict how much you can usually consume. But since cloud computing allows flexibility of consuming computing resources, exceeding that allowance can happen and can cost you additional charges. Especially for a growing small or medium business, this is a concern because budget speaks in almost all their considerations. So, take notice of bandwidth offers, or better yet, get cloud computing services that offer unlimited bandwidth. Concerns in data security is the top setback in the list of cloud computing advantages and disadvantages. Since all that you upload on the Internet can be accessed thru the Internet, there are cybercriminals that can also forcibly access your data. That is why it is a must that you check the security systems offered by the cloud computing service you will avail. Make sure that they can ensure data security and ward off malicious online activities. The list of cloud computing advantages and disadvantages does not end with these four. Start your online business right by understanding the cloud computing advantages and disadvantages before choosing your provider.